The results are published, and are positive! In the first half of 2018 the digital ad market grew by 10%. The market reached €25.7 billion in Europe compared with €23.4 billion in the first half of 2017. This is an "adex Benchmark 2018" study conducted by IHS Market on behalf of IAB Europe which studied 27 markets, including France. 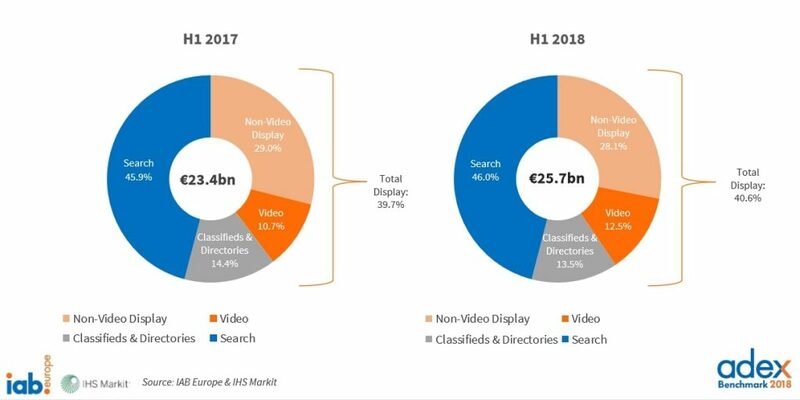 The search goes from € 10.7 billion in 2017 to 11.8 billion in the first six months of 2018, which represents an increase of 12.3% with 46% of budgets are for digital advertising spend. The display, goes from €9.3 billion to € 10.4 billion, so even more than 10% of evolution or 40.6% of advertising expenses. The mobile for the first time reached 10 billion euros in the first half of 2018. Today mobile accounts for 50% of digital advertising expenses. The Social Media represents 51.5% of the display expences in the first half of 2018. Constantly evolving ! To sum up, the digital market is booming these days and is becoming the remote with the time. More than ever, brands communicate via digital channels. Consumers are increasingly connected.